They’re not quite magical, but self-steering bullets designed by the Pentagon’s advanced research agency actually adjust their trajectories to hit moving targets in difficult environments and from long distances. The Defense Advanced Research Projects Agency (DARPA) conducted live-fire tests of the bullet, or its Extreme Accuracy Tasked Ordnance (EXACTO) round, in February. In a video of the tests published this week, the bullet is shown, in several examples, successfully hitting a moving target with both experienced and novice shooters pulling the trigger, according to the Verge. 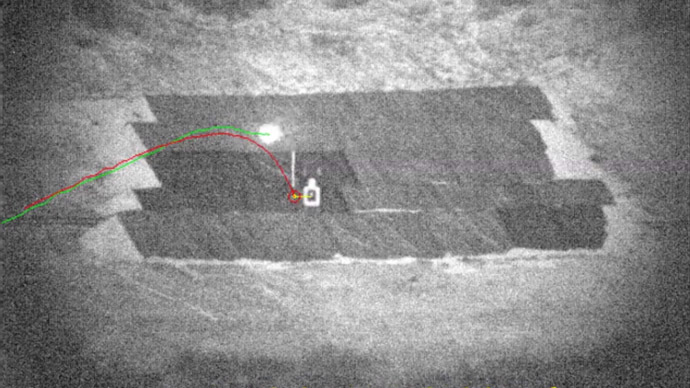 The video shows EXACTO rounds maneuvering in flight to hit targets that are offset from where the sniper rifle is aimed. While the exact technologies used remain classified, an automatic aiming rifle consists of two parts – a guidance system and the bullet. The first tracks the target, meaning that the sniper simply has to “see” it with a sophisticated optical sight, and sends signals to the bullet. EXACTO’s specially-designed ammunition features sensors and a real-time optical guidance system, which help track and direct projectiles to their targets by compensating for weather, wind, target movement and other factors that could impede successful hits. The new rounds are designed for professional snipers, but as the video shows, the EXACTO rounds find their mark even when a first-time sniper pulls the trigger. The EXACTO program was developed to help military snipers hit their targets despite unfavorable conditions such as high winds and dusty terrain that the military often encountered in Iraq or Afghanistan. The EXACTO program was created to revolutionize rifle accuracy, with a .50 caliber round and optical sighting that extends day and nighttime range over current state-of-the art sniper systems. The Pentagon has invested more than $25 million in the program since its inception in 2008. Currently, US Army snipers are expected to hit a target 600 meters away, nine times out of 10. But after a certain point, about a kilometer away, accuracy declines sharply, even in perfect conditions. EXACTO promises a range of up to 2,000 meters, as well as a virtual indifference to conditions.